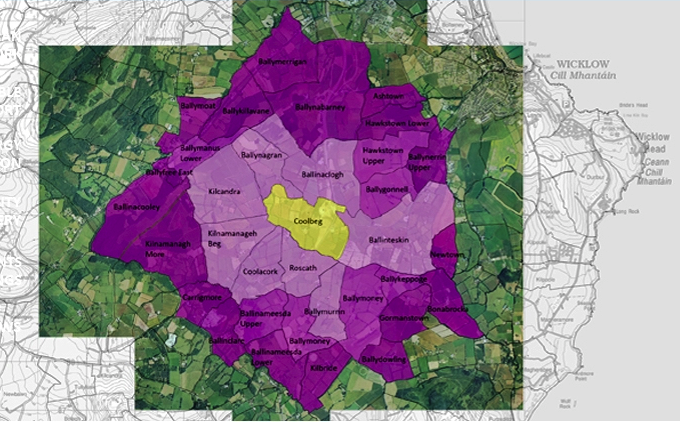 This is map of the townlands included in the Ballynagran Energy Plus⁺ area. Among these townlands are the following: Ashtown, Ballinaclogh, Ballinacooley,Ballinameesda Lower, Ballinameesda Upper, Ballinclare, Ballinteskin, Ballydowling, Ballyfree East, Ballygonnell, Ballykeppoge, Ballykillavane, Ballymanus Lower, Ballymerrigan, Ballymoat, Ballymoney, Ballymurrin Lower, Ballymurrin Upper, Ballynabarny, Ballynagran, Ballynerrin Upper, Bonabrocka, Carrigmore, Coolacork, Gormanstown, Hawkstown Lower, Hawkstown Upper, Kilbride, Kilcandra, Kilnamanagh Beg, Kilnamanagh More, Newtown, Roscath. An area comprising approxinately 3500 hectares is included in the project.